Think you know every college out there? Think again. Here are some diamonds in the rough from The Badger State. Beloit College (Beloit, WI): Not exactly a hidden gem, Beloit deserves much more credit than it gets! It touts its liberal arts as "amplified" and allows students to choose from more than 50 majors or create their own. 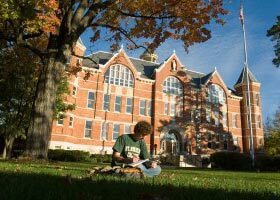 Carroll University (Waukesha, WI): Friendly and caring Carroll is a Catholic university, but students of all faiths are truly welcomed here and will find a home on this lovely, leafy suburban campus just outside of Milwaukee. This small Midwestern university has developed excellent physical therapy and physician's assistant programs as well as a superior program in athletic training. Ripon College (Ripon, WI): Ripon describes its education style as "intensely personal," with a focus on personal academic development. The curriculum emphasizes the practical application of liberal arts skills, leading to good job and career counseling. Close mentoring by faculty members helps students hone their ability to articulate and advocate for themselves. Ripon has a specific mission to education first-generation college students, and a first-rate disabilities office and program provides support for those who need it. The student body is a mix of rural farm kids, urban minority students, students the LDs, and suburban kids from both Milwaukee and Chicago. The college awards financial aid to almost every student and has strong Bridge, Trio, and McNair Scholars programs. Ripon even provides a bike for every student, making it easy to get around campus. The college has a deep-rooted sense of tradition and provides opportunities for all its students to shine through research, plays, athletics, and more. This is a perfect place for students who are not quite sure if college is for them. University of Wisconsin — Whitewater (Whitewater, WI): A lovely rural campus of the University of Wisconsin, UW-Whitewater is situated not far from Milwaukee, Chicago, and Madison. It is small in size, so students get the feel of a liberal arts college for the price of a public institution. The university even lets Illinois students pay the same cost of attendance as in-state students. UW-Whitewater is particularly well respected for how well it helps first-year students transition into college.